Ed Notes Online: Are Green Party Defections Due to Trump's Pushing People To Democrats, Countering Some Left Analysis? Are Green Party Defections Due to Trump's Pushing People To Democrats, Countering Some Left Analysis? Normally, I would agree with the Jacobin election analysis. But you'll note that all the victories were for Democrats, not Greens. Are we tacking left? If so what about the massive drop in vote totals for The Green Party in the NYS governor race? Totals dropped from 5% to less than 2% in the election for governor of NYS between the 2014 and 2018 election - from 184,419 votes to less than 80,000 at last count. Howie Hawkins was the candidate both times - and everybody loves Howie -- but his Lt Gov was Brian Jones in 2014 and Jia Lee in 2018 - both are associated with MORE and a socialist agenda. The Green platform was a very progressive agenda -- social democracy at the very least -- the kind of agenda I would normally support. One of the ironies of Trump is that people seem to be moving from the left and more towards the center as a better alternative to the horrible Republicans. And as an aside, thinks of how this analysis might apply inside the UFT where the MORE Caucus is tacking left in the expectation that the membership is also moving in that direction. I and a few others still around MORE who don't quite agree are taking a wait and see attitude. I often vote for the Green Party but hesitated to do so this time due to my sense that we are stuck in a two party system and with the Republicans being the party of Trump, it is not easy to brand the Democrats as being little different. I got a dose of this first hand from a close family member who despises Cuomo almost as much as Trump but voted straight Democratic line as a way to register her protest against Trump. So, given the option of voting Green or voting for the despised Cuomo despite his tacking left, my sense if that many people felt the same way. Last night's elections were an important repudiation of Trump — and another confirmation that voters will embrace left-wing policies over watered-down centrism, explains Keeanga-Yamahtta Taylor. By running to the right, Democrats insist on losing twice: at the polls and in constructing an inspiring agenda. Bold left-wing politics are our only hope for long-term, substantive victory. When it comes to beating Trump, baby steps are not enough. America’s decades-long shift to the right won’t be undone with Democratic Party liberalism. Normally, I would agree with the Jacobin analysis. But if you read some of it you'll note that all the victories were for Democrats, not Greens. But right now I am thinking I want an FDR New Deal, which has been being undermined by the Republicans, aided by the Clinton/Obama Democratic neo-liberal wing of the party. If people hadn't jumped into the despised (on the left) Democratic Party, there would be no victories. Rather than jumping into left-wing parties, I'm feeling that we are at a stage that requires many people to work in the Democratic Party even when some elements are not of a perfect political flavor. Like can the party exist within the two poles of Connor Lamb and Alexandria Ocasio-Cortez? I'm willing to give it a try. But I also want to note that AOC has come under severe attack from the left-wing ideologues, so expect them to keep attacking the Democratic Party but when it suits them to brag about victories over Trump by the Dems. I have the sense that it is time to join my UFT brethren in working in the Democratic Party, pushing for a progressive program. Not a radical program, but progressive. I just may start going to UFT Retiree chapter meetings and look at some options -- and let me note I hate canvassing and calling from phone banks but may have to bite the bullet. 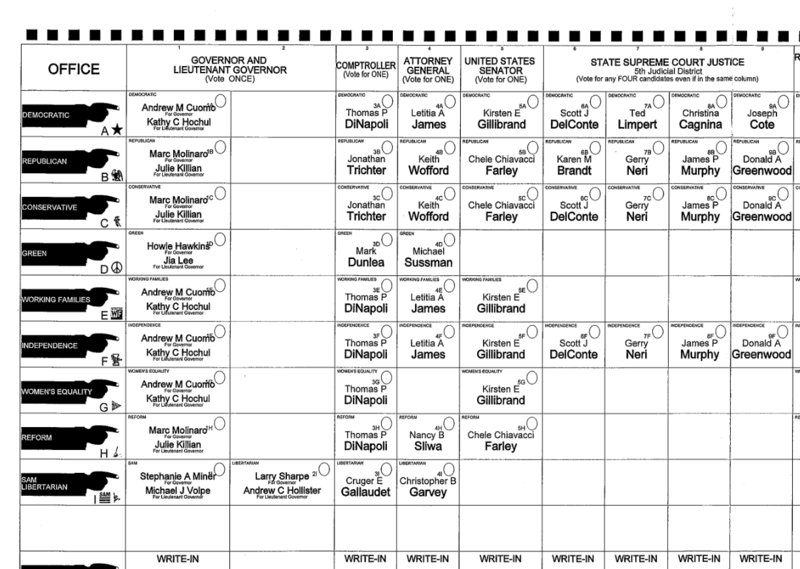 I couldn't mark the ballot box for Cuomo but also couldn't vote Green. Someone reminded me that former Syracuse Mayor Stephanie Miner, who at one time wanted to challenge Cuomo in the primary, was also on the ballot and I want to encourage diversity inside the Dems, so I voted for her. But there is some good news for the Greens, as evidenced in this article from a Syracuse newspaper. Syracuse's Howie Hawkins has succeeded in his attempt to keep the Green Party's status as an official party in New York state. With 83 percent of the vote counted, Hawkins had won 79,640 votes. That was less than 2 percent of the vote against the winner Gov. Andrew Cuomo and challengers Republican Marc Molinaro, Libertarian Larry Sharpe and Stephanie Miner, who ran on a new party called the Serve America Movement. Sharpe has also won enough votes to give the Libertarian Party a line for the next four years. Miner was behind in her effort to win a ballot line for the SAM party. Although he has not won office in more than 20 tries, Hawkins has been a powerhouse for the Green Party's ballot placement. Candidates who win at least 50,000 votes in the race for governor win an automatic ballot line for the party for the next four years. It means candidates who run on the Green Party line for all state and local races can collect fewer signatures than independent party candidates. It also means Hawkins appeared fourth on the ballot this year. The Green Party appeared fourth on the ballot in NY thanks to Hawkins' strong showing four years ago in the race for governor. Hawkins inched the Greens into recognized party placement in 2010 with 59,906 votes. With a higher ballot line, Hawkins won 184,419 votes in 2014, according to the NYS Board of Elections. The Green Party boasts that it has successfully won a ballot line three terms in a row by running its own candidates rather than cross-endorsing major-party candidates. Third parties--particularly the Green Party--are still capable of causing havoc. "After seeing the most recent poll numbers, I felt the only way I could make my Senate race matter is to withdraw from it.I knew I wasn’t going to win, so being a true candidate for the people and not the politics, I felt that if I withdrew and could endorse a candidate closest to the ideas and views of those whom I represent, then at least I can feel as though this withdrawal from the Senate race will not be in vain. So I made the hardest decision of my Green Party campaign and that was to drop out and endorse Kyrsten Sinema of the Democratic Party. Although not perfect, she is better than the alternative." We will get the usual argument from the left that Sinema just wasn't progressive enough--compared to what, a R neanderthal who reinvented herself as a full-Trumpian? Here, at least, the very same Green Party nominee said all that needed to be said. I feel your pain about Crumo. I voted for every single democrat, but left Gov blank. Wherever possible I voted Working Families line. It's not an endorsement of them, but wanted to help ensure they keep an automatic line on the ballot.